PMA is a dry mount adhesive roll that requires no machines, electricity or heat. It is ideal for heat sensitive paper. Allows for repositioning before permanent bonding. For professional artists and framers. 3M Positionable Mounting Adhesive is great for mounting, paste-up work, or matting. Available in three sizes. Plastic squeegee included. 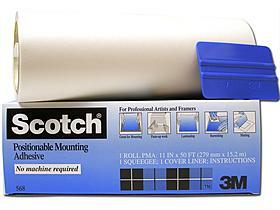 3M Scotch Positionable Mounting Adhesive is a dry mount adhesive roll that requires no machines, electricity or heat. It is ideal for heat sensitive paper. These 3M Scotch Brand adhesive rolls allow for repositioning before permanent bonding. For professional artists and framers. The long-lasting adhesive will not discolor or dry out. 3M Positionable Mounting Adhesive is great for mounting art prints, RC photos, cibachrome prints, posters and maps. Scotch Mounting adhesive rolls available in three sizes - 12", 16" and 24". Plastic squeegee included. Great product! Awesome price! Super fast shipping! What's not to love? Thank you. We always order the scotch 568 rolls from Buz-Line. They ship them to us same day we order and we get them here in Milwaukee next day! Works perfectly! Thanks for the prompt delivery! This product works great for our presentations. We just found buzline who is local, and we are able to pickup at their warehouse immediately. Great Price! I'll def be back for more.